Enclosed is a report on the activities of the Assembly Committee on Economic Development, Job Creation, Commerce and Industry. A number of important measures were passed by both houses of the State Legislature in 2005, and most have been signed into law by the Governor. For as long as I have been in Albany, I have maintained that the very best state economic development program is to continue to reduce the costs of doing business in our state. We’ve certainly made progress, but much more remains to be done. Knowing your thoughts is the best ammunition I can have, so please feel free to contact me with your comments on these or any other issues of concern to you and your business. Chairman Schimminger makes a point during a meeting of the Joint Budget Conference Subcommittee on Economic Development. 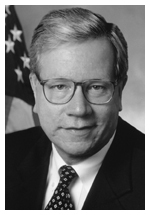 The panel, which the assemblyman co-chaired with Senator William Larkin, shaped the Assembly and Senate’s joint economic development plan that was incorporated in the 2005-2006 state budget. Creation of Investment Zones and Development Zones. Allows for a greater level of benefits for companies that create jobs in distressed communities (Investment Zones). Special Consideration for Manufacturers. Allows manufacturers to receive the greater benefit levels regardless of the type of zone in which they are located. Reconfiguration of Existing Zones. Requires all zones to be reshaped into separate contiguous areas so that zone boundaries are readily apparent to prospective businesses. Existing certified zone businesses no longer within such reconfigured boundaries are grandfathered in the Empire Zones program as long as they remain otherwise qualified. Authorization of “Regionally Significant Projects.” Allows for manufacturing projects or other large-scale projects to be located outside of a zone’s contiguous areas. Containment of Sprawl. Requires, to the extent possible, that all zones be located in areas where there is existing water and sewer infrastructure. Expanded Benefits. Establishes a new method of computing tax benefits based on a percentage of wages paid so that businesses that pay higher wages receive greater benefits. Greater Oversight and Accountability. Requires both the Commissioner of Economic Development and the Commissioner of Taxation and Finance to issue comprehensive annual reports on the performance and cost of the program, and subjects certain businesses that may have received benefits without creating jobs to a “valid business purpose” test to determine if they should remain in the program. In addition, 12 new zones were authorized over the next 4 years, and the program, which was due to expire on March 31, 2005, was extended until June 30, 2011. Listed below are some of the economic development and business-related measures that were passed by the State Assembly during the 2005 Legislative Session. Many of the bills also have been passed by the Senate and have been signed into law by the governor. Assemblyman Schimminger and Senator Dale Volker presided at a meeting of the Western New York State Legislative Delegation and their Niagara Region counterparts in the Ontario Legislative Assembly. The legislators met to discuss the potential impact on cross-border commerce and travel posed by Washington’s plan to require that a passport be presented at the border by Canadians when entering the U.S. and by all U.S. citizens upon returning home from any visit to Canada. Canada is New York State’s primary export market, with nearly 350,000 New York jobs supported by U.S.-Canada trade, and New York and Canada boast the largest bilateral tourism industry in North America. 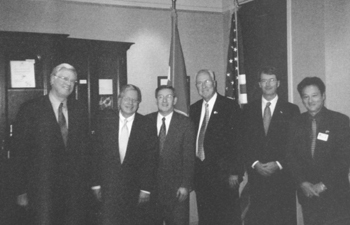 Pictured are (left to right) Senior Advisor to the Premier on Border Issues Michael Kergin; Chairman Schimminger; Member of Provincial Parliament, Government House Leader and Ontario Minister of Tourism Jim Bradley; Senator Volker; Canadian Consul General Steven Brereton; and MPP and Government Whip Kim Craitor. In an effort to maximize the impact of the state’s investments in high tech academic research, the State Legislature has moved to replace the New York State Office of Science, Technology and Academic Research (NYSTAR) with the New York State Foundation for Science, Technology and Innovation. The new foundation, to be governed by a board that includes representatives from the private sector, government and higher education, will administer all of the programs formerly administered by NYSTAR, plus assume additional duties that will generate regional economic activity, particularly from discoveries made at our world class research institutions. Among the additional duties of the foundation will be the distribution and administration of funds to regional partnerships comprised of local economic development organizations and academic research institutions. These new partnerships will allocate funds to help commercialize innovative products and processes for emerging technology sectors, including biotechnology, nanotechnology, bioinformatics, software design, innovative energy efficiencies, and environmental technologies, as well as other related purposes that will support regional economic growth. One of the state’s most innovative – and most successful – economic development initiatives is the Linked Deposit Program (LDP), which enables small businesses to obtain the financing they need to stay competitive. I authored the law creating the LDP in 1993, when I chaired the Assembly Committee on Small Business, and I have sponsored several laws since then that have expanded and improved the program. Through the LDP, small and medium-sized businesses can obtain loans “linked” to deposits of state funds into more than 100 participating commercial banks, savings banks, savings and loan associations, and farm credit institutions, as well as the New York Business Development Corporation. In turn, these lenders agree to make linked loans to eligible firms at interest rates that are two or three percent below current market rates. State funds are made available to the program on a revolving basis, and the amount available for new projects is replenished as existing deposits mature. As the state’s role is limited to program eligibility approval and the lenders make the actual credit decisions and are responsible for servicing the loans, the LDP application and approval process has just a five-day turnaround. The LDP is designed to encourage and assist New York businesses to undertake investments that improve their performance and competitiveness, leading to a stronger economic climate in the state. Since the program’s inception, LDP has funded nearly 2,000 projects with some $700 million in loans, leveraging more than $1.4 billion in new capital investment by businesses statewide. More than 95 percent of LDP loans have been provided to small businesses with fewer than 100 employees and those companies have received over 90 percent of the aggregate loan dollars. For more detailed information on the LDP, including business and project eligibility, businesses should contact their lending institution or the nearest NYS Empire State Development regional office. The award-winning Linked Deposit Program is an excellent example of the kind of public/private sector partnership needed to sustain economic growth and generate jobs in today’s changing economy. 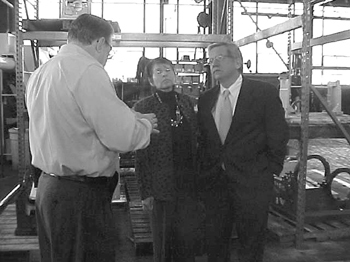 Dan Petko, Manager of Manufacturing at SFC-Adams, Inc. in Tonawanda, explains how industrial water strainers and filtration systems are manufactured and shipped to overseas customers to Federal Reserve Bank Buffalo Branch Manager Kausar Hamdani and Assemblyman Schimminger. Exports of such equipment to Latin American and Asian markets, boosted by SFC-Adams’ participation in a World Trade Center Buffalo Niagara (WTCBN) small business trade assistance program, have enabled the company to grow its sales volume. Chairman Schimminger helped provide a $50,000 state legislative grant for the export program to the WTCBN, which is part of a global network of nearly 300 sanctioned world trade centers in more than 100 countries. 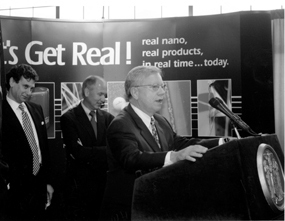 Assemblyman Schimminger is shown with NanoDynamics Inc. chairman Allan Rothstein and chief executive officer Keith Blakely as they announced the Buffalo high tech company’s expansion. NanoDynamics develops nanomaterials – materials, components, devices and systems that are produced at the near-atomic, or nanometer, level. The innovative company will be creating 325 new jobs and investing $9.7 million to significantly expand its operations over the next five years with the help of a state capital grant and Empire Zone benefits. In addition to ensuring that ongoing reductions in temporary taxes put in place following the 9/11 terrorist attack on New York City would take effect as scheduled during the 2005-06 fiscal year, the State Legislature enacted several new business tax cuts as part of our 2005-06 state budget actions. Annual tax savings when fully effective are noted. Personal Income Tax – Lets the temporary personal income tax rate surcharges for incomes above $100,000 and $500,000 completely phase out as of December 1, 2005. Subchapter S Corporations – Restored the S corporation differential provision between the corporate franchise tax rate and the personal income tax rate, so that S corporation shareholders can again benefit from the lower PIT rate. Sales Tax – Allowed the ¼ percent temporary state sales tax surcharge to expire as scheduled on May 31, 2005, returning the state sales tax rate to 4 percent. 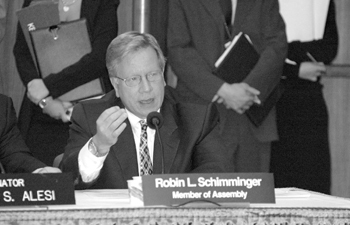 The 2005-06 state budget provided legislative funding through Chairman Schimminger’s efforts for several economic development initiatives in Western New York. Buffalo Niagara Enterprise (BNE) - $300,000. The Assembly again allocated funds for the BNE’s regional business marketing initiative. The BNE’s advertising campaign and trade show and other promotional activities are designed to expose the Buffalo Niagara region to site selection professionals and corporate decision makers as a desirable location for new or expanding businesses. Although the BNE’s recent successes with the Geico, Definity Health and Delaco Steel projects are bringing hundreds of new jobs to the region, the agency had been hit with a sizeable loss of local government financial support. American Axle & Manufacturing Inc. (AAM) Tonawanda Forge Plant - $1,000,000. American Axle’s Tonawanda Forge plant won continued Assembly support for its multi-year workforce training initiative. Legislative funding in recent years has supported a training program jointly developed by management and labor to address a nearly 80% turnover in the facility’s workforce following AAM’s acquisition of several automotive parts plants in Michigan and Western New York from General Motors. AAM has invested more than $160 million in the 820-employee Town of Tonawanda forging facility, and intends to build upon that investment in order to secure additional new business from GM and other automakers and suppliers. NYS Center for Engineering Design and Industrial Innovation (NYSCEDII) - $250,000. Established at the University at Buffalo in 2000 with Assembly seed funding, NYSCEDII provides manufacturers access to world class computer-simulated design and visualization facilities and gives existing and spin-off companies a leg up in developing new products, attaining a highly trained workforce and improving production processes. NYSCEDII’s industrial outreach, training and education, and research missions provide the potential for establishing Western New York as a cluster for high-end visualization and design engineering. Interested companies can contact NYSCEDII at (716) 645-2685 or online at www.nyscedii.buffalo.edu. World Trade Center Buffalo Niagara (WTCBN) - $50,000. A regional business development organization committed to helping grow Western New York companies through international trade, the WTCBN is part of a network of nearly 300 certified World Trade Centers in more than 100 countries. This state legislative funding will help to expand the WTCBN’s Local Access to Global Markets Program that assists small manufacturing companies with export development activities such as market or industry-specific research, market entry planning, regulatory reviews, due diligence of product certification/standardization, identification of distributors and end users, and international marketing support. Information on the Local Access to Global Markets Program or other WTCBN trade initiatives can be obtained by calling (716) 852-7160. Canisius College Women’s Business Center (WBC) - $25,000. The Women’s Business Center at Canisius is one of 80 U.S. Small Business Administration-designated WBCs in the nation. Through the center’s various training, counseling, coaching and networking programs supported in part with these state funds, women entrepreneurs and small business owners are provided the critical skills, knowledge, support network and contacts necessary to start or grow a business. For more information, contact the WBC at (716) 888-6650 or www.canisius.edu/wbc.